Everyone gushes over typewriters. I, myself, though I have one, still swoon over every mint condition machine I encounter. However, what are your thoughts on typewriter ribbon tins? Oh, I absolutely adore them just as much. For me, they are simply perfect examples of aesthetics and good design in an everyday object (well back in the day that is). 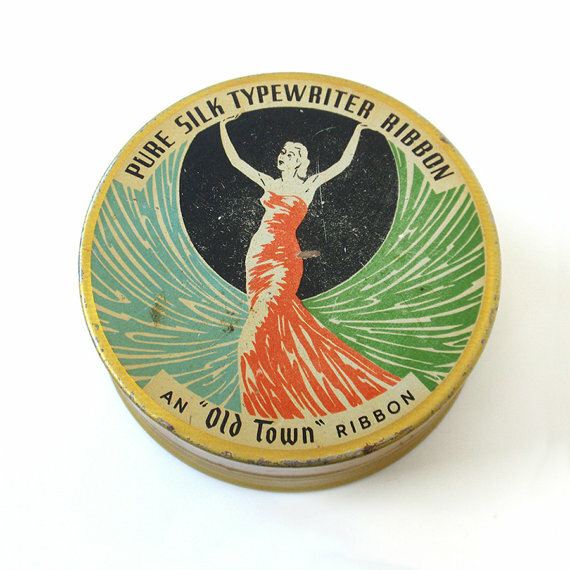 Typewriter ribbon tins were made up until the 1960s. Thanks to competition (everyone needed typewriter ribbon - from companies to individuals) designs became a way to not only advertise but catch the consumer's eye. Usually they were lithographed, but sometimes you find tins with labels placed on them. They tend to come in rounded square shapes or in circles. Luckily for collectors, many people saved their ribbon tins to store bric-a-brac, which is why you can find a good deal today to start your own collection. These vintage items are around 2 1/2 inches in size and usually range from $5 up to over $50. I have even seen some selling online for over $100 (for example the Panama Standard example below). It usually depends on design, maker, scarcity (how many were made / in circulation today), and condition. Here are a few of my favorites that I found currently available online. I hope you see the beauty and charm in these small metal containers as much as me. I really do find them utterly delightful.